With our new wireless Temperature Sensors, it delivers precision comfort to the rooms where you spend your time, not just where the thermostat happens to be. Here's what to do. 1: Install sensors in your favorite rooms. Chances are that your thermostat doesn't live in the room where you spend most of your time. Even if it sits in your living room, it doesn't know the temperature in your kitchen or bedroom, which tend to be different. The solution is a temperature sensor on the wall of each room where the temperature matters to you at some point during the day. Your bedroom and living room are strong candidates, but everyone's needs are different. If you're a new parent, for example, you'll want a sensor in the nursery. Now that you have temperature sensors around the house, you can specify which sensor commands the thermostat. For example, let's say that it's bedtime. Downstairs, where the thermostat sits, the temperature is a comfortable 72 degrees. Upstairs, though, it's 76 degrees—too warm for a comfortable night. Simply open your Alarm.com app and tell your smart thermostat to optimize the home's temperature for the bedroom until your bedroom sensor registers 72. It's easy to create a schedule where your ideal temperature ‘follows' you around the house throughout your day. In this simple example, the user assigns a different sensor to each thermostat mode in their Alarm.com app. For energy savings in the daytime (Away), they use the main thermostat. For evenings (Home), they use the living room sensor. At night (Sleep) the bedroom sensor takes over. After that, they use their slider as normal to control when each mode takes effect. If your family don't tend to congregate in a single room, you can set your thermostat to target the average of every sensor's temperature. This enables you to heat your home based on the general temperature throughout the house, with warm and cool spots taken into account. It's a great way to make your home more comfortable overall. 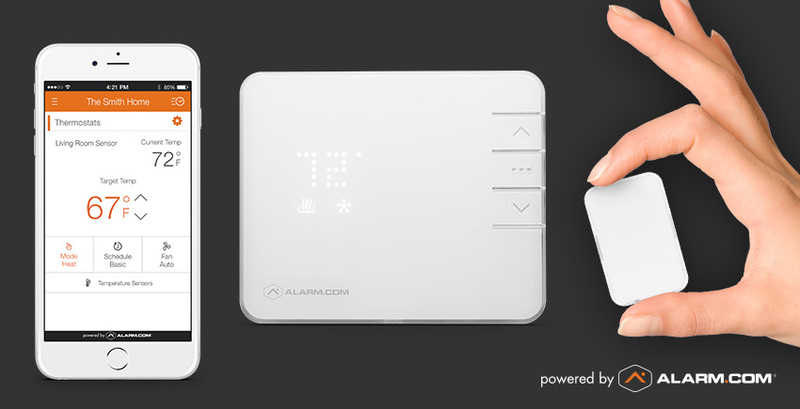 Temperature sensors are just one source of intelligence that the Alarm.com Smart Thermostat uses to save energy while keeping you comfortable. Click here to discover more of them.